For somebody in a one-sided relationship with his alcohol, I’m not a very big ‘birthdays’ person – I mean what the devil is the big deal, pray tell me? Yes, you were born – but is that really your achievement? More like your parents’ if you ask me; for going through 9 stressful months to see your ugly little face! Yet, we celebrate this day each year with pomp and much clamour. Me? I like to hide away in a corner and retreat into my shell, only letting in the most precious people in my life! Generally, I like to get away from my immediate surroundings accompanied only with some combination of my favourite music, a good book and closest friends. We arrived in the land of bagpipers & excellent Scotch (slurp!) after a long drive from the Lakelands of Cumbria – which by the way is an absolutely blissful place to spend some time in [Read: A Weekend In The Lakelands of England]. Our visit was short – restricted to 2 days, thanks largely to amateur planning (hey! don’t be quick to judge, this was my first international trip on a tight budget). We decided to spend the first day in Glasgow, before driving down the same day to the capital wonder of Edinburgh! Before any of you look at the length of this piece and decide to bugger off elsewhere, I’ll jump directly to the part that is truly a MUST-DO experience (my must-do list is a little difficult to break into – it only includes experiences without which I’d consider my life a complete waste). On the eve of my birthday, after wandering around the cobbled streets of Grassmarket in the Old Town, I made my way to the Beehive-Inn for The Edinburgh Literary Pub Tour! What followed was a couple hours of stunning entertainment in the extra-ordinary company of Clart & McBrain (our guides), who’d take me and a dozen or so other lucky folk on a whirlwind waltz across the city’s most iconic & oldest pubs and their intertwined histories with some of Scotland’s greatest literary scholars! I’m a complete sucker for literature; though admittedly, I’m no scholar on Scottish literature and I knew or had heard of none, barring a few of the names the duo mentioned while painting a colourful picture of Edinburgh’s literary history. 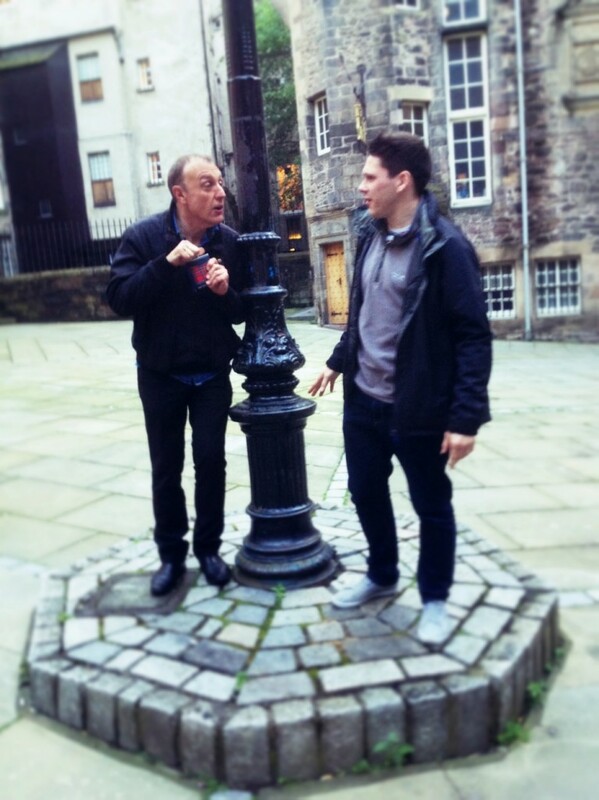 Unlike most guided walks and tours in different parts of the world, The Edinburgh Literary Pub Tour is hosted/performed not by tour guides or academics but by professional actors! Both Clart & McBrain are charted characters played by accomplished theatre persons and the difference is frankly evident – the entertainment value = TOP notch! Clart is a coarse, whiskey-drinking, no-nonsense bloke who doesn’t shy away from the vile realities of society, whereas McBrain is a gentleman, sitting high on his horse of morality, with displaced pretensions of the world – he refuses to acknowledge the influence of alcohol & women on the work of modern society’s great artists. The brilliant pandemonium starts off in the comfortable upper room of the Beehive Inn with Clart addressing the day’s participants. After a brief introduction of all the participants, the charade takes off! SPOILER ALERT: you’ll wonder where McBrain is during Clart’s opening speech…soon enough though, you’ll find a fellow audience member constantly engaging and refuting your solitary host’s claims! In no time, Clart invites his adversary to the debate and the well-oiled dialogue begins. The narrative is in English for most parts, but the the quoted texts are in Scots. The focus is not so much on understanding the words; they do offer explanations & translations from time to time but the idea is to communicate the importance of a language in their medieval culture – even one that has faded from use in normal life but remains alive mostly through street-dialogue & literature. Beehive Inn - Where It All Begins! The Cozy Ensign Ewart with its many trinkets! 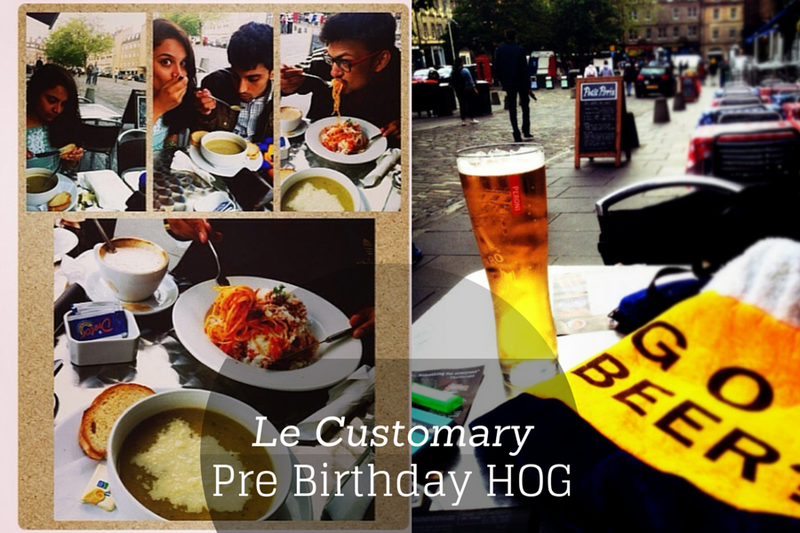 Did You Know: that many traditional pubs in Edinburgh were named after the landlady of the inn? The tour sheds light on literary figures across the years, starting from Roberts Burns, the Scots’ National bard to Alan Ramsay, Sir Walter Scott and many others I’ve neither heard of, nor remember. The whole story revolves around the opposing ideological stands the pair represent, as they cross swords over what constitutes a typical Scot, and what potentially inspired some of these literary works-of-art! Clart & McBrain in an animated discussion! Clart has no qualms about plunging his arms deep into the bowels of the Scottish social psyche as he reveals parts of the lives of these famous gentlemen that are otherwise brushed under the mat in literary gatherings! He argues and repeatedly points out how many of them were renowned for their private drinking clubs & indiscriminate womanising – clues to which are also hidden in plain sight within their works. McBrain on the other hand squirms at the slightest indication that such primal roots could have potentially inspired some of the country’s most famous literature! The pair use their theatre background to great effect and draw the audience in – it was also thrilling to see that some of the participants (unlike my amateur self) actually had a good sense of Scottish history & literature and seemed to be thoroughly enjoying the show, punctuated by constant humour and witty one liners. The 2 hour walk through the cobbled streets of Edinburgh, takes you to some of the city’s most historic & oldest pubs such as the Ensign Ewart & The Jolly Judge in addition to the Beehive Inn, which is estimated to be more than 300 years old! What better way to sample the different kind of ciders & beers (not to mention the scotch) than in a traditional Scottish pub? While the pace is usually gentle, the city’s naturally sloping streets mean you require some degree of fitness. The walk through the Old Town & New Town of Edinburgh is also one of the best ways to see the city and its timeless architecture. As we finally settled down at the last pub of the tour – The Kenilworth, Clart & McBrain launch into some wonderful poetry recitals! I don’t follow very well (partly because it’s Scots and partly because I’m getting to my ‘happy-high drunk’ phase) but the duo appear to have reached some sort of common ground as McBrain seems to begrudgingly concede the importance of alcohol & other alleged ‘vices’ in every society. There aren’t too many times when travellers struggle to pin a city down to one particular attribute that sets it apart, but Edinburgh is one place that really had me stumped. I mean how do you even choose between an inactive volcano at the centre of the city, a conveyor belt of excellent centres for applied and performed arts, the spectacular castle and truly orgasmic architecture all-round or the raging connection between its pubs & never-ending list of famous poets & writers? It’s ridiculous to think that I spent 2 nights and 1 day (half of which was wasted in finding a parking spot) in this wonderful city – it remains one of my greatest regrets to date that I didn’t have enough time to look at the magic around me; yet, the place cast a tremendous spell upon me – the effects of which still don’t wear off after 6 months of procrastination! Side Note: my fellow lit-pub travellers were a wonderful bunch of people and helped make this evening even more memorable. I met a German professor who had spent some time in Mumbai (my home-town) and was excited to meet somebody from the same place again. I shared a drink with a wonderful, elderly American couple – I must admit I actually sat next to them only because the gentleman looked like Sir Alex Ferguson, but it turns out the poor pair didn’t even know who that might have been! HA! My favourite way to explore a new city is to walk through its busiest streets. This is the main reason guided/unguided walking tours have become so close to my heart! Are you also fond of walking tours? Which one’s your favourite and why? What a good idea, a tour guide done by professional actors! Definitely want to try that. It is, isn’t it? They were brilliant – I think their acting school skills were on proud display. Great characters and very very well played out. OMG! I’ve heard so much about Edinburgh and I know I should definitely go there one day! You should. Without a doubt. Probably one of the best cities in all of Europe, and it’s quite under-rated in comparison to the usual suspects. Great post! I, too, have gone to some pretty exotic places to celebrate my birthday over the years. They sure make the birthdays easier to take. HAHA! There’s a pub in Grass Market that offers to look after your husband while you go do your thing. They actually advertise that on a board outside – it’s one of the most hilarious boards I’ve ever seen. I’m pretty sure you might find some such similar place to look after your kids too. I know you loved Edinburgh – I think it’s a brilliant city. Full of history, both ancient and contemporary, and such wonderful architecture. HA! Well, I must admit Nikoleta, that’s one way of looking at it. I never thought of birthdays like that, but yes, I guess another reason to celebrate life for sure! I haven’t been to Edinburgh I have recently done a couple of tours with actors involved. Did the London Ghost Bus Tour and Jack The Ripper walking tour… both amazing and so much fun! I love Edinburgh. I have done the walking tour but not the literary version, it sounds interesting. I love their pubs and whiskey! I don’t usually had a grand birthday celebration too. And this time just like what you did. I’m planning to celebrate my birthday next month in other country. Im really excited 🙂 great place! I love that actor guided tour. Thats amazing! This makes me so happy! Welcome to Scotland. Firstly, thanks for going to Glasgow, travellers tend to bypass it for the beauty of Edinburgh, every Scot knows that Glasgow is actually our best city – it’s raw! Secondly, thank you for teaching me something new! I did not know that about the pub names, I’ll need to tell me Mum. At present, I am reading Skagboys, which is the prequel to Trainspotting, the modern Scots Language is even tough for me to understand! Another well-written post, always a pleasure! haha! I’d be lying if I said Glesca was my favorite city in Scotland, because I simply love Edinburgh too much, but it was quite awesome nonetheless. Loved the steep roads in the city, and I made camp at Blackfriars and King Tut’s – loved both pubs. Where are you guys from exactly? Fife! A small seaside town called Burntisland. So if you were at the water in Leith you would be looking over at my family! Creepy! Thanks Trisha! It’s quite an adventure to do something on your birthday you’ve never done before, innit? Girl! I should celebrate a birthday with you (with a good old aged scotch, cheers by the way!). I’m so happy that you decided on going to Edinburgh for your birthday, seems like it is all worth it! I loved this Pub Trail on cobbled street. Wish you much more on your next four birthdays!! Thank you Himanshu. You should definitely do it if you find yourself in the Scottish capital.